Chart of the Day, 10 February 2015: Debt As an Existential Threat? McKinsey Global Institute continues to run with a series of reports on the global credit bubble that spurned the Great Recession. The latest titled “Debt and (Not Much) Deleveraging” takes up the story seven years after the crisis (click for larger image). 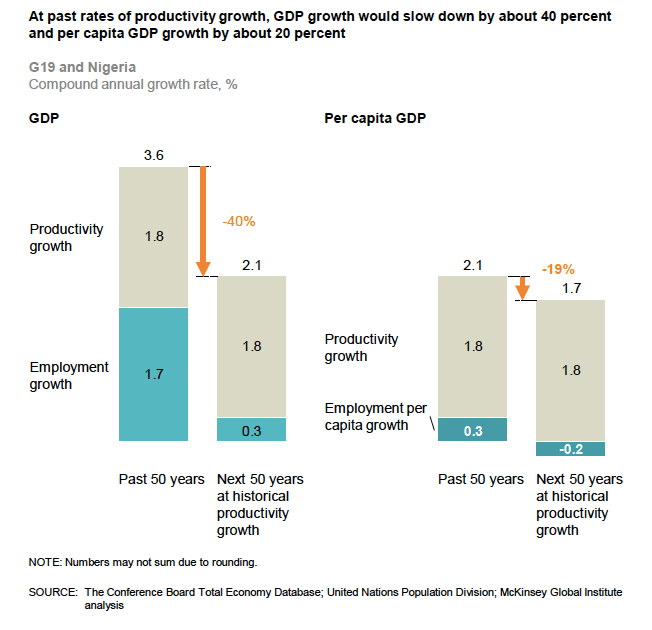 The report shines a spotlight on the world’s growth problem. Other things being equal, higher debt should translate into higher effective demand, either through increased investment or greater consumption. Again, other things being equal, more investment should result in a rising capital stock, which in turn should lead to more growth. Further, if growth were accelerating, then the debt-to-GDP ratio should be falling. Yet this text book economics isn’t panning out. Instead, we have rapidly rising debt and anaemic GDP growth. Result: debt-to-GDP grows and grows (click for larger image). Commentaries at the doomer end of the economic blogosphere suggest that debt matters more than anything else–and, for some, burgeoning debt means the world is on the verge of a financial panic and subsequent collapse. But the relationship between the real economy and the financial economy is a complex thing. I can’t count the number of times that people confuse debt with stuff. Debt is not stuff: debt is a claim on stuff. Expand, contract or shuffle the debt–do what you will–and the same amount of stuff still remains. Take the purest form of monetary collapse: the Weimar German hyperinflation between 1921 and 1923. During this period, fiat money became worthless. Yet the real assets of the economy remained intact. Germany had almost the same number of factories in 1923 as it did in 1921. It had the same number of engineers, even if many lost their jobs. And, ultimately, this real economy was sufficiently robust to reignite within a year or two. Money died in 1923 Germany, the real economy didn’t. What’s more, the real German economy then took a second financial punch in the form of the Great Recession in 1929. Yet despite undergoing all this turmoil (which makes our 2008 crisis look insipid by comparison), the German real economy had enough inherent strength to go on to support the expansionist policies of the Third Reich for a decade. So when money died in Germany, the real economy didn’t. By contrast, what did die along with money were many of the original ownership claims on the real assets. Who owned what in 1924 (after the situation stabilised) was very different from who owned what in 1920 (before hyperinflation took off). Moreover, during the hyperinflation years, assets remained idle and incomes fell. So there were real effects–they just weren’t ever-lasting. During the 2008/09 credit crisis we similarly witnessed under-utilised assets, and the claims on those assets were shuffled around to a certain extent. But the real assets that make up the real economy lived on. True, we had what Austrian economists call mal-investment. That is, the financial economy directed the real economy to make some real assets that no one wanted a year or two down the road. But the largest dead assets of America, such as the decaying factory and residential blocks of Detroit, are not the result of a credit bubble that went pop, but rather are due to far deeper and slow-moving underlying real economy forces. For this reason, I don’t see debt as in the same league of existential threats to well-being as climate change or resource depletion. To restate my argument: on the positive side, our most-pressing problem is not that of a dysfunctional financial system. But on the negative side, this means that the financial system will provide only limited help in solving our existing challenges. Before the financial crash, it seemed that modern finance, derivatives and all, had led to a step-change improvement in matching limited resources with limitless needs (what economics is all about). That step-change improvement now appears a mirage. But this also means that real change will ultimately have to come from changing the real economy–and that, in reality, is a far tougher thing to do than fiddling around with our banks and brokers. Basic message is get used to slower growth, since much of past growth was achieved on the back of an expanding labour force. As usual, a big caveat: growth does not equal welfare, although it does more so in less-developed countries. Separately, I think the productivity forecasts look a bit rich, which means the growth slowdown could be even more extreme. The dance between technology and productivity is a hot, hot topic in economics at the minute and I will return to this theme later. Finally, the McKinsey numbers fail to capture the impact of resource constraints and climate change, both of which will be kicking in with a vengeance well before the 50-year forecast comes to pass. Economic welfare, at both the household and state level is a function of both income and wealth. For example, if a country’s wealth (capital stock and infrastructure) is getting trashed by climate change then economic welfare will fall even if income (GDP) is holding up.